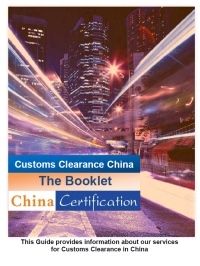 Here you can subscribe to download our free booklet about customs clearance in China with extensive information and explanations about our customs clearance services, the CIQ declaration, the CCC clearance certificate and CCC exemptions. Please enter your name and email address below to receive a confirmation link. After confirming, you will be given a secure link to download the PDF file. We never spam, share or sell your address.